"To preserve covered bridges. To gather and record knowledge of the history of covered bridges. To collect and preserve pictures, printed, and manuscript matter and other articles of historical interest concerning covered bridges. To do all things, alone or in cooperation with other persons or corporations, necessary or advisable to carry out any or all of the foregoing purposes and objects." Our monthly meetings are held in various locations, usually in New England, March through October. The next meeting will be Saturday, May 4, 2019 at 1pm at the Norman Williams Public Library, Woodstock, Vermont. For those who already have a current World Guide, an update is available in PDF format. The update has additions and corrections as of April 10, 2019. A quarterly containing research articles about covered bridges past and present. For those researching covered bridges, an index to all Topics issues (1943-present) is now available. 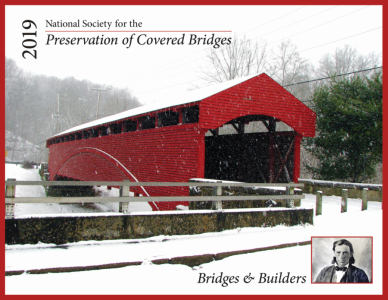 Our Newsletter informs members of society events and covered bridge news. The Winter 2019 newsletter was posted on February 28. The 2020 Bridges and Builders calendar should be available in May. Click here for the details. Not a member? Join today or renew your membership online using PayPal. Get your 2019 Bridges & Builders Calendar.